This exciting game is easy enough for children and challenging enough for adults, making it a family favorite for generations. Now it's bigger and better! Size (inches): 12.48" X 3.31" X 15.43"
This jumbo-sized version features a whopping game mat (32" x 27"!) for play on the floor or a tabletop. Play a card from your hand and place a chip on a corresponding space on the mat. When you have five in a row, you have a Sequence! Deftly block your opponents and remove their chips. But look out - Jacks are wild! You win when you or your team makes one or two Sequences (depending on number of players). Game includes: game board, 104 Sequence cards, 50 green marker chips, 50 blue marker chips and 50 red marker chips. For 2 to 12 players. The greatest part of this Jumbo Sequence game is that when you get a 'sequence' you flip the chips over and they have a whitish tinge on the other side of the chip. This makes it easy to see each sequence on the board. The mat is large-sized as well which makes it easier to reach for your squares. 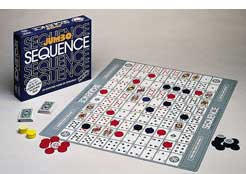 More Photographs - Sequence - Jumbo - Suggested Retail $44.99 ! End of More Photographs - Sequence - Jumbo - Suggested Retail $44.99 !